“I need to get to Wroclaw, Poland today” I complained to the woman at the ticket counter in the bus station in Berlin. “The next bus leaves tomorrow at 1 am and arrives at 6 am” she said. I had missed the 9 am bus, which, for reasons no one seemed to know, had chosen to leave at 8:30 am. The website had listed several buses to Wroclaw each day so I was now confused. Perhaps, if I took a bus to another city in Poland, I might be able to get to Wroclaw the same day. I found a Polish bus driver smoking a cigarette outside a bus labeled Krakow and by way of hand gestures, waving my ticket and using my very small Polish vocabulary, I explained my dilemma. “There is a bus to Wroclaw at noon” he said and immediately called and arranged for me to use my 9 am ticket on the noon bus. Simple. I concluded that Germans only have information on the main German-operated bus line. That afternoon, I was on my way to Poland, my second visit to Poland. My first visit was when I was young, accompanied by my father and brother. I was introduced to my father’s homeland during the final years of Soviet communist control. We could not visit Wilno, my father’s birthplace, as the Kresy lands (the eastern borderlands of Poland) had been annexed by the Soviet Union after the second world war. Even with access to many places restricted, our activities closely monitored and our movements controlled, I was left with clear and vivid memories of the economic hardship in this largely agrarian country, queuing for rationed food that often ran out, street-corner black market money-exchangers seeking US dollars, crumbling infrastructure and large, unfinished buildings. On this visit, I went to the western part of Poland comprising the eastern lands of Germany that were ceded (repatriated) to Poland after WWII. Poland today is a thriving, economically stable country, attractive to foreign investment and much influenced by the west. It was good to see the change. 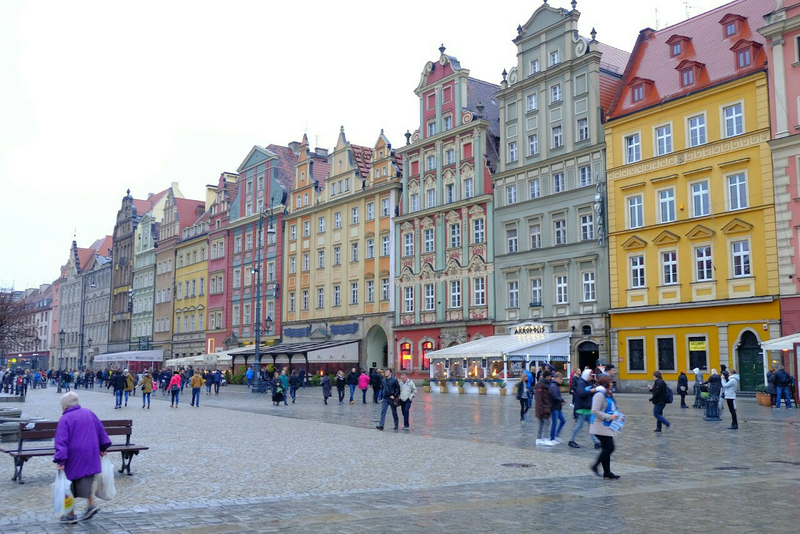 Wroclaw, previously the German city of Breslau and capital of Silesia, is a bustling city of 300,000 people. The main market square in the early morning was a peaceful place, certainly more peaceful than the place I was staying, and the mist enveloping the old city softened the pastel-coloured townhouses and offices around the square making them particularly beautiful. In Berlin, I had stayed in a hostel/hotel (hostel atmosphere but with private rooms and bathrooms). It was inexpensive, friendly and had a comfortable common area in which to relax and talk with other travelers. I tried the same here but found out too late that I shared the place with a group of teenagers on a school trip. Teens traipsing around in their pyjamas, giggling girls knocking on the doors of each other’s rooms, boxer-shorted boys playing video games, various types of music being played at the same time and kids laundering their blue jeans. Fortunately, it was not a long stay and the place was extremely convenient to the heart of the city. Now a fan of free walking tours (having done one in London, Cologne, Munich and Berlin) I find these a great introduction to a city and to see things you might otherwise miss. I spent my first morning free-walking and learning about Wroclaw. 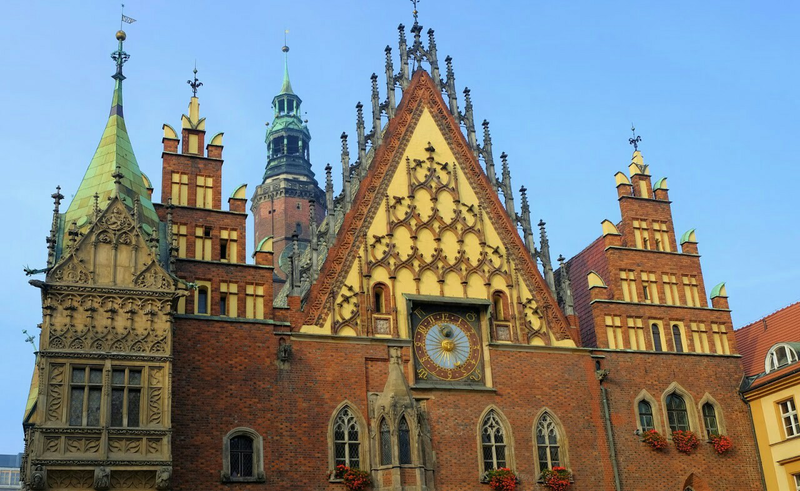 We saw the Gothic old town hall that dominates the market square. It was built in many stages over 250 years beginning in the early 1300s. Over the centuries, the look of the building changed considerably and even the east and the west elevations look quite different. It was carefully restored after WWII to its late 18th century appearance. 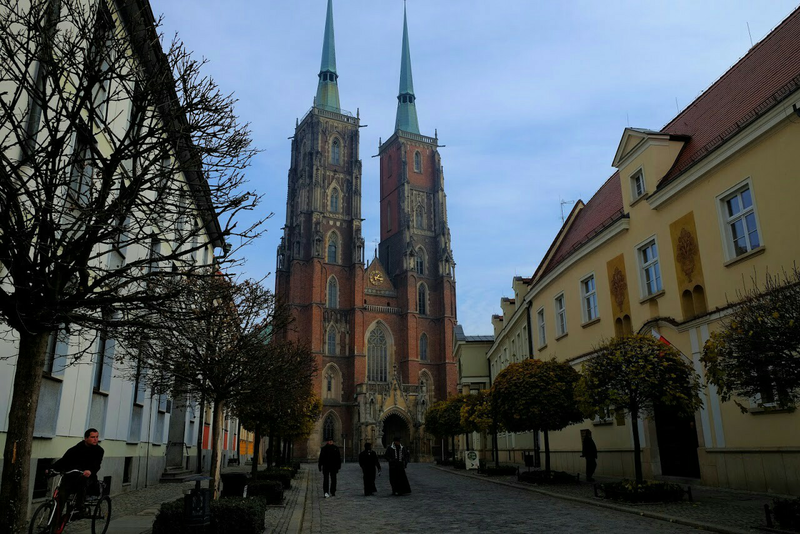 I visited the Gothic cathedral of St. John the Baptist, the fourth church built on the site; the first one was built in the middle of the 10th century. After a turbulent history of invasions, fires, restorations, bombings and reconstructions its most recent look was finally completed in 1991. We passed the museum wearing its fall colours and the stunning baroque University Church of the Blessed Name of Jesus that was so dark inside that its beauty was hard to see. 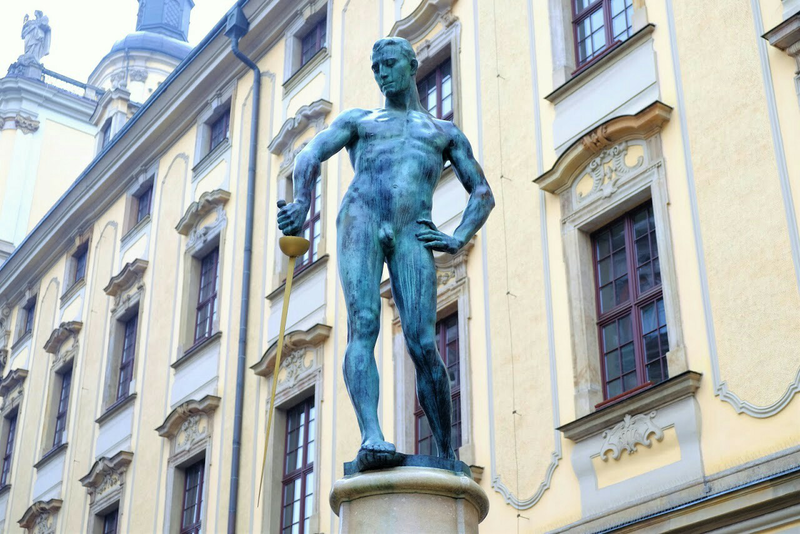 And I saw the very handsome, naked swordsman outside the University of Wroclaw. He was completed in 1904 despite protests by parish priests fearing he would morally corrupt students. He was allowed to remain by arguing that he was a high-rolling, gambling student who drank to excess and lost everything except his sword playing cards, and that he provides an example to students of the consequences of such a lifestyle. No doubt life at Wroclaw U was exceedingly boring post installation of the man-with-the-big sword. 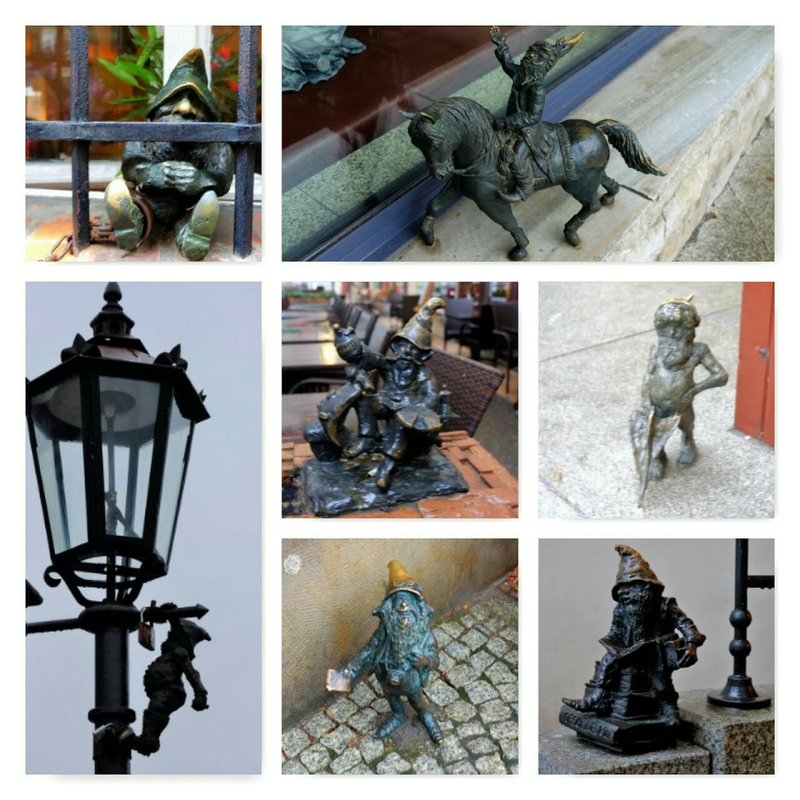 And finally, I learned about the dwarves of Wroclaw. The dwarf was the symbol of the Orange Alternative anti-communist movement in the 1980s. In 2001, one was put in the city in memory of this movement. The number has now grown to 300, scattered throughout Wroclaw. After two days it was time to move on. I joined 14 other English-speakers from around the world (New Zealand, the UK, the USA, Canada and Australia) as mentors for 15 Poles in a one week English immersion programme in the Karkonoski Mountain area near the Czech Republic border. 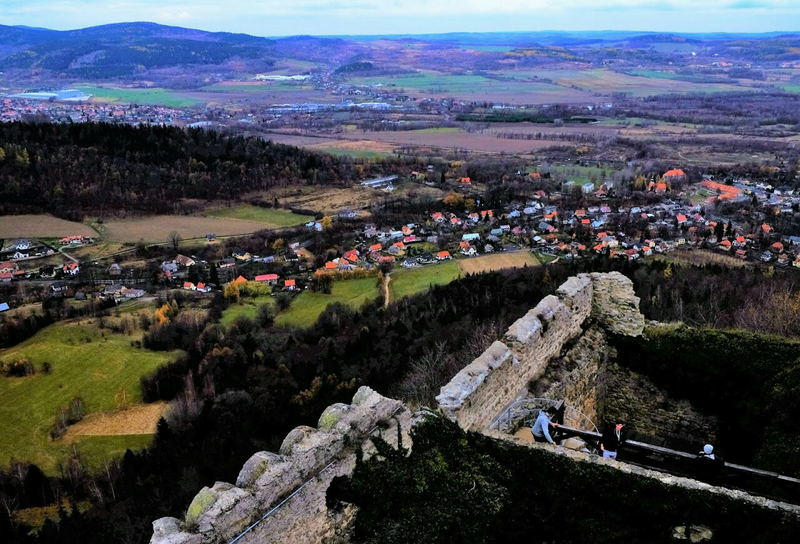 We spent our days speaking English with the Poles as we wandered the countryside, and our evenings drinking vodka, beer and wine and speaking more English (albeit less eloquently) often exchanging travel tips and stories as most of the English speakers had been traveling for many months. Staying in one place for a week was a nice break. 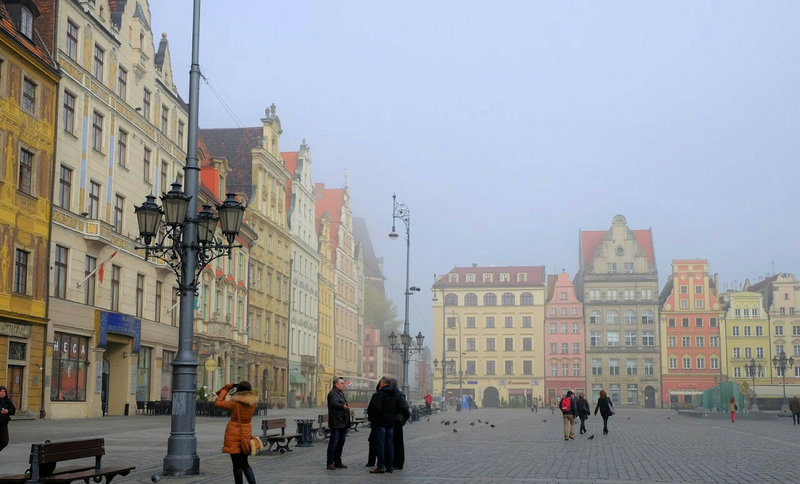 Arriving back at Wroclaw at the end of the week I began to feel uneasy. I had a ticket for the 2:30 pm bus back to Berlin the following day. Did that really mean 2:00 pm? Which post would it leave from? My ticket didn’t say. I walked over to the bus station early the next morning. The timetable on the wall did not list my bus. With trepidation I approached the ticket-lady for information. “Post 11 or 12” she said. That exhausted her English vocabulary. I returned at 1:50 pm – just in case. I looked at the bus timetables on posts 11 or 12 but neither listed my bus. There were many kiosks at the station, each with food, drinks and cigarettes but no information. I waited. At 2:25 pm there were no buses. I found a bus driver smoking a cigarette. Déjà vu? He said my bus to Berlin would be at post 12 shortly and an identical one labeled Berlin would be at post 11 shortly. Both buses go to Berlin, but mine is the one at post 12. Why? I have no idea. How did he know? I have no idea. I don’t question bus drivers any more. I am confident that they are the people in Europe with all the information. I climbed aboard and closed my eyes. Dobranoc Polska i dziekuje bardzo. Polish bus trips make me weary.